The Jews Tortured or Expelled. Capital of the Swiss Confederation. Jews resided within its territory as early as the sixth century, but the first documentary evidence of Jewish inhabitants in Bern is for the year 1259. Though under the protection of the city, with the emperor as their real liege lord, they were usually in an unprotected state. In the separate Jews' street in which they lived, near the present Casino, was also their cemetery, which, after their expulsion in 1294, became private property; and in the "Inselgasse"—as the Jews' street was called after the convent built by the "Inselschwestern"—there was found in 1888, when the "Inselspital" was torn down, the tombstone of a Jew, dated 1293 (Studer, in "Archiv des Historischen Vereins des Kantons Bern," iv. 1, 38; iv. 2, 15; viii. 56, 212). The Jews of Bern devoted themselves exclusively to banking and pawnbroking. As in Basel and Zurich, the rate of interest fixed by the government was 43%, two pennies per week in the pound; later it was reduced to 30%. All classes—the clergy and the nobles, the burghers and the peasants, as well as the convents and the towns—regarded the Jews as their brokers; and in order to protect the Christians, the city council decreed, at Easter in 1283, that the term set for repayment should be limited to one year. Through their money transactions the Jews earned the hatred of the populace, and as the citizens of Bern were deeply in debt to the Jews and, through various circumstances, were reduced to financial straits, they cast about, shortly after the death of Emperor Rudolf, for means of acquittal. A pretext for action against the Jews was soon found. In 1294 they were accused of having kidnaped and killed a boy named Rudolf (Ruff). This accusation, which was also made at about the same time against the Jews of Colmar and Mayence, sufficed to start a persecution. The Jew Joel (Föli), who was regarded as the real offender, and all other Jews of Bern, women as well as men, were seized and maltreated, and either tortured or driven from the town. This event has been wrongly assigned to the year 1287, during the reign of Emperor Rudolf (Stettler, "Schweizer Chronik," i. 20; Justinger, "Berner Chronik," pp. 38 et seq. ; Ulrich, "Schweizer Geschichten," pp. 144 et seq. ; "'Emeḳ ha-Baka," p. 56; Zunz, "S. P." p. 33, etc. ; compare "Annales Colmariens." 28, for the year 1294; "Judæi Bernenses Puerum ut Dixerunt Occiderunt"; Tillier, "Gesch. des Freistaates Bern," i. 72; on the murder of the boy Rudolf, see Stammler, in "Katholische Schweizerblätter," 1888). King Adolf, perhaps appealed to by the Jews themselves, appointed a commission to investigate the matter, composed of the bishop Peter of Basel, the knight Gottfried von Merenberg, governor of the realm in Burgundy; Cuno von Bergheim, and Hartmann von Ratzenhausen. This commission decided, June 30, 1294, that the Jews, male and female, should forfeit all their claims against the mayor, the council, the community, and every one living in Bern up to the time of the decree; that they should give up all their securities and pledges; and that, in addition, they should pay to the community one thousand marks in silver, and to the mayor of Bern five hundred marks in silver—according to the standard of weight in Bern. King Adolf confirmed this enactment Aug. 1, 1294, in Frankfort-on-the-Main. The Jews assigned to the mayor in payment of his share their claims against the Knights of St. John, the monastery of Interlaken, Ulrich von Thor, and others. A characteristic expression is found in the receipt of the mayor, Jakob von Kienberg: "Pro occasione pueri, videlicet b. Rudolfi quem dicti Judei, ut dicitur, occiserunt." The same cautious phraseology, "ut dicitur," was employed by King Albrecht six years later, when he confirmed the decree, April 29, 1300 ("Solothurner Wochenblatt," 1828, pp. 192 et seq.). 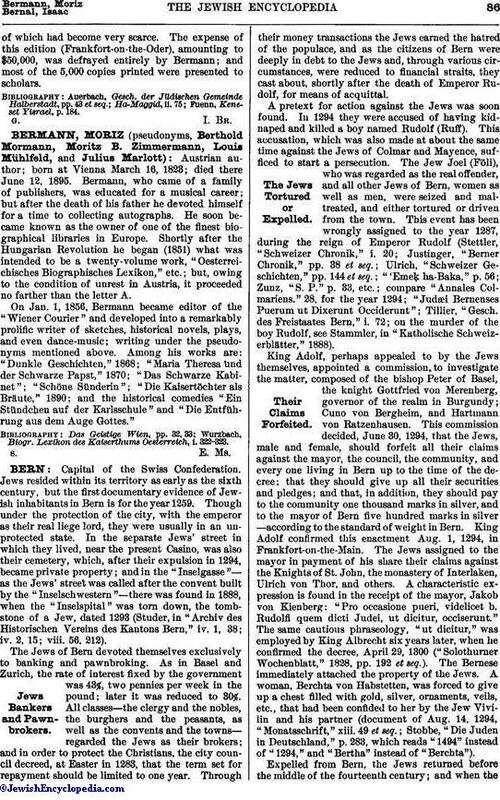 The Bernese immediately attached the property of the Jews. A woman, Berchta von Habstetten, was forced to give up a chest filled with gold, silver, ornaments, veils, etc., that had been confided to her by the Jew Vivilin and his partner (document of Aug. 14, 1294, "Monatsschrift," xiii. 49 et seq. ; Stobbe, "Die Juden in Deutschland," p. 283, which reads "1494" instead of "1294," and "Bertha" instead of "Berchta"). Expelled from Bern, the Jews returned before the middle of the fourteenth century; and when theBlack Death swept the country in 1349, the people of Bern and of Zofingen gained the questionable reputation of fanning everywhere the hatred against the Jews, burning or banishing them and destroying evidences of indebtedness to them, as at the former persecution. Twenty-five years later there were again Jews at Bern. In 1379 Master Isaac von Tanne, who lived there, loaned to the city of Freiburg 1,470 gold gulden. This "modest man," probably from Thann in Alsace, was, like Master Mathys Eberlin and his wife, Esther Merlinon, a money-lender. At the end of the fourteenth century the Bernese showed a positively friendly feeling for the Jews, not only permitting them, for financial reasons, to settle in Bern, but naturalizing them for periods of six years, in consideration of a yearly tax of sixty schiltfranken in gold. They were not restricted in their worship; on their festival days they were not to be called into court; matters of dispute among themselves could either be decided according to Jewish law or be brought before the Bernese courts; butchers were enjoined to sell the meat killed according to Jewish ordinance, at the same price as other meat. About this time Christians also engaged in the money-lending business in rivalry with the Jews. As soon as the Bernese were easier financially, the old hatred against the Jews revived, stimulated by Justinger, author of a Bernese chronicle, who was also a notary public, and as such carried on money transactions. His proposition to expel the Jews found no lack of support, for "the Council and the Two Hundred of the City" decided unanimously, May 10, 1427, to drive the Jews forever from the city and the country. This decision was carried into effect, and matters continued thus for several hundred years. Not until about 1820 did Jews again settle at Bern, and coming, as they did, mainly from Alsace as French citizens, they were given absolute religious freedom. 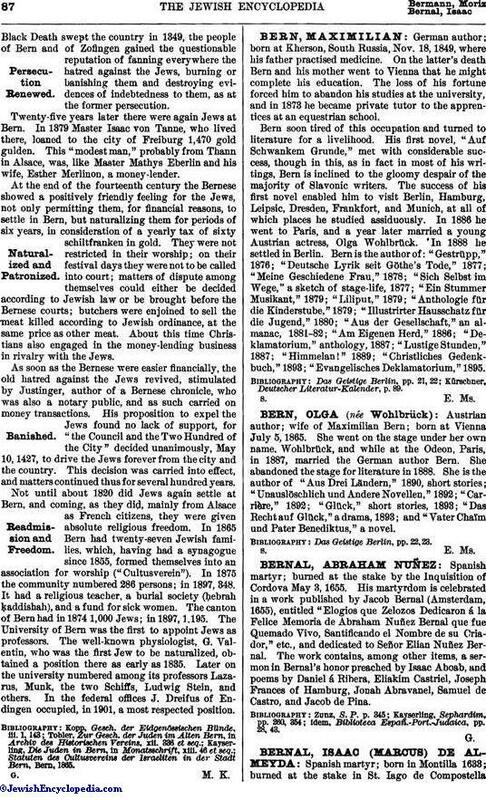 In 1865 Bern had twenty-seven Jewish families, which, having had a synagogue since 1855, formed themselves into an association for worship ("Cultusverein"). In 1875 the community numbered 286 persons; in 1897, 348. It had a religious teacher, a burial society (ḥebrah ḳaddishah), and a fund for sick women. The canton of Bern had in 1874 1,000 Jews; in 1897, 1,195. The University of Bern was the first to appoint Jews as professors. The well-known physiologist, G. Valentin, who was the first Jew to be naturalized, obtained a position there as early as 1835. Later on the university numbered among its professors Lazarus, Munk, the two Schiffs, Ludwig Stein, and others. In the federal offices J. Dreifus of Endingen occupied, in 1901, a most respected position. Statuten des Cultusvereins der Israeliten in der Stadt Bern, Bern, 1865.